A look at what's going on at Chapman University's Dodge College of Film and Media Arts from semester to semester. Profiling our special events, programs, students, and alumni. 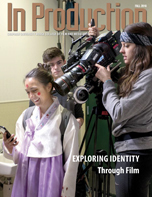 Career Spotlight: Rebecca Haber (BA/PRA ’15): "Making the Digital World Better, One Superhero at a Time"
Past issues of In Production Magazine are available in the In Production Archive. A complete overview of Chapman University's Dodge College of Film and Media Arts. For additional information or any media request/inquiry, please contact Meagan O'Shea, Communications & External Relations Manager.